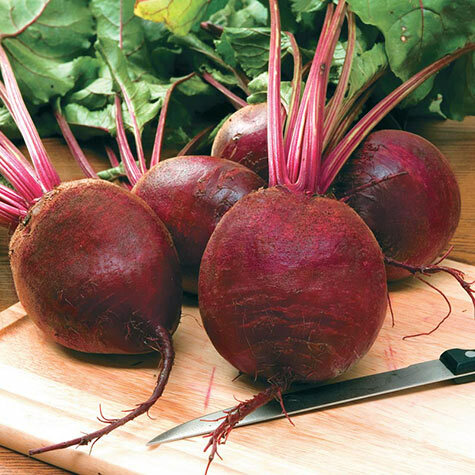 Harrier Hybrid Beet | Gurney's Seed & Nursery Co.
No need to add butter to these irresistible treats. The richest, sweetest beet we've ever tasted, Harrier is a delight to grow. Big, vigorous tops can be enjoyed steamed or in salads, while roots grow up to softball size and are still tender and delicious! Full of flavor whether enjoyed fresh from your garden, canned or pickled. 50 DAYS. Botanical Name: Beta vulgaris var. 'crassa' Family: Chenopodiaceae (Goosefoot Family). Height: 13 - 16 inches. Spacing: 3 - 4 inches between plants and 12 - 24 inches between rows. Days To Maturity: 50 days. Soil Requirements: Deep, rich, sandy soil; pH 7.0. Seed Count: Approximately 200 seeds per packet. 1/2 oz. is approx. 600 seeds. Seed tape is 15 feet long and has approximately 95 seeds. Size: Best at slightly larger than golf ball size. Comments: Best flavor of any beet. Tastes like butter has already been added.